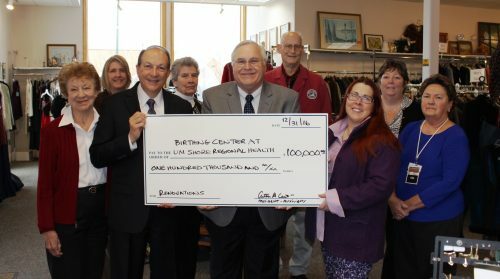 The Auxiliary of Memorial Hospital at Easton recently donated $100,000 to UM Memorial Hospital Foundation to support the Birthing Center at UM Shore Medical Center at Easton through proceeds raised by their thrift and consignment shop in Easton, The Bazaar at 121 Federal Street, Maggie’s Gift Shop and special event sales. The funds will support the renovation of the birthing center, which is now in progress. The Auxiliary of Memorial Hospital at Easton works to raise funds for equipment, programs, services and patient care at UM Shore Medical Center at Easton, and various outpatient locations throughout UM Shore Regional Health, including the Clark Comprehensive Breast Center, the Cancer Center and various rehabilitation facilities. To support their fundraising efforts, the Auxiliary has two retail locations; The Bazaar at 121 Federal Street and Maggie’s Gift Shop, located inside the main entrance of UM Shore Medical Center at Easton. The Bazaar at 121 Federal Street shop offers gently used designer and non-designer clothing for the entire family, shoes, fashion accessories and small household items. Maggie’s Gift Shop, managed and staffed exclusively by members of the Auxiliary, is located on the first floor of UM Shore Medical Center at Easton and offers a variety of unique gift items, jewelry, books, cards, holiday-themed decorations and snacks. Volunteers are currently being sought for both locations, and in other capacities throughout the Auxiliary. For more information, call 410-822-1000, extension 5839.